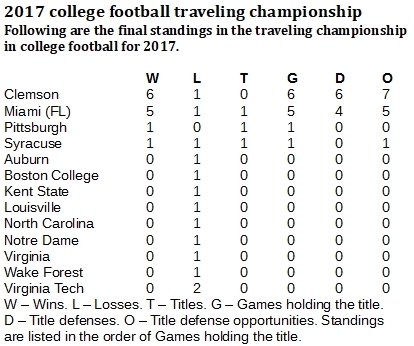 Miami dominated college football's traveling championship during the early years of 21st century, while Clemson has been a power in more recent years. But both teams made big gains in 2017. Miami and Clemson, the two leading teams for the national college football traveling championship in 2017, tell much of the story of the 21st century for this competition. Of all teams across the country, Miami has more more traveling championship wins of any team during the 21st century, fashioning a 37-2 record. All-time, going back to 1979, Miami is 41-8, second only to Alabama (43-7) in the standings. But Clemson had the slightly better title run in 2017 – six wins over five. The Tigers captured the title by defeating Alabama, 35-31, in the 2016 National Championship Game. The Tide had captured the title for the first time since 2010 with a 33-24 win against Texas A&M in Tuscaloosa on Sept. 24, 2016, then held it for five more games before meeting Clemson. Before holding that title, Alabama held 37 championship wins all-time, one more than Miami, which had 36. So the run enabled the Tide to pad its slim lead, which came in handy once Oct. 21, 2017, came around and Miami ran onto its home field with a chance to snag the championship from an unlikely holder, the Syracuse Orange. One week earlier, Cuse snapped Clemson's seven-game title streak with a 27-24 upset win in the Carrier Dome. No one would expect the Orange to beat quality teams in consecutive games, and so it was no upset when the Hurricanes claimed a 27-19 win to regain the national traveling title. The Canes hung on through four more wins before finally losing, 24-14, at Pittsburgh on Nov. 24, the final game of the regular season. With a win against Pittsburgh, Miami would have taken the title to the Atlantic Coast Conference (ACC) Championship Game against Clemson with a chance to tie Alabama at 43 wins on top of the all-time list. 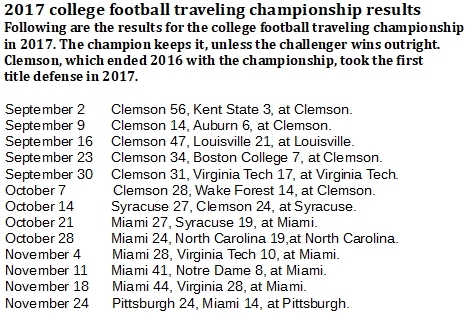 Clemson is 17-6 all-time for the national traveling championship, but the Tigers are a force of the more recent years of the century, whereas Miami was a huge force during the earliest. Clemson is 14-4 since the start of the 2011 season. In that time, Baylor also has 14 wins, and the only team with more is Texas Christian, with 18 wins. Miami made its mark with a 32-game championship winning streak, the longest in 40 years of the national traveling championship. On Oct. 7, 2000, the Hurricanes posted an epic 27-25 win against Florida State in Miami, breaking a 15-game championship streak for the Seminoles. Miami held the title for the remaining seven games of the 2000 season, for the entire 2001 season and for all of 2002. The Canes finally lost the title in one of the greatest games ever played, Ohio State's 31-24 overtime victory in the Fiesta Bowl on Jan. 3, 2003.